One of the greatest regrets I have from growing up is giving up guitar lessons when I was in fourth grade. I began taking them in the third grade and continued for over a year until practicing began to feel like homework and I ultimately gave it up. It wasn’t until later in grade school when bands like Nirvana came out, that I decided to pick it back up and teach myself. The main problem was the lack fun in learning the instrument. That was back in the days of the first Nintendo and Sega. Games were purely entertainment then. Now that the gaming industry has progressed to the point of nearly lifelike graphics, online gaming, and 3D technology, people are spending more and more time in front of the monitor and less time being productive. It’s a constant argument that video games are consuming kids’ valuable learning and exercise time, but some gaming companies are making an effort to change that by creating games that bring a little fun into learning. Following in the footsteps of Guitar Hero and Rock Band, Ubisoft has developed Rocksmith, a interactive game to learn playing the guitar. 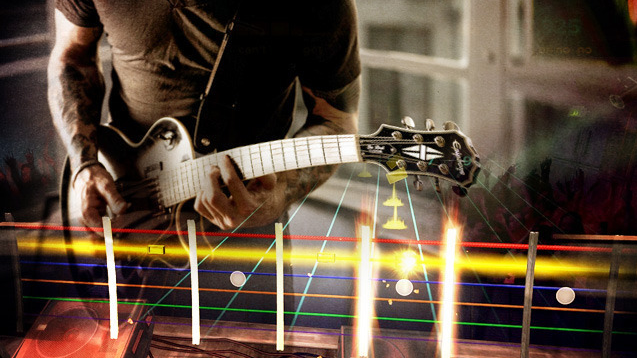 Unlike Guitar Hero or Garage Band, Rocksmith is developed to actually help you learn the instrument. Instead of a plastic guitar with four buttons, you can plug in any real guitar. The game also offers a wide selection of amplifiers and effects pedals to choose from. In the game, a difficulty system was developed to figure out the player’s skills and adjust the difficulty level accordingly as the player progresses. If a player is able to strum a chorus easily, but is struggling with a solo, the game will up the difficulty level of the chorus while making the solo easier. There are also exercises/games at the beginning that teach chords and strumming. In one, a player would hit notes in order to shoot ducks fleeing down the fret board. In another, players strum in various sequences to put a series of falling tiles in the right order – “Tetris” with a guitar. The system seems to be great for the beginner, but some argue that not being able to choose difficulty levels will alienate moderate to experienced guitar players. You can’t just play along with the songs the first time. You have to move your way up the difficulty level, which for an experienced guitar player can be incredibly boring. But I guess if you are already to that level, you might as well just plug in an amp and play along with the real song. There are also complaints that if the console is not connected correctly, you will experience lag on the audio playback, so be sure to read the instructions. I’m sure there are plenty of pros and cons with this system and the game experience, but I think most importantly, this could be a great alternate teaching method to leaning guitar, especially for young kids. I don’t think it will ever replace the benefits of a traditional instructor, but it could help keep the student engaged in the learning process by making it a little more fun.